Say community to most bloggers and they automatically think: email list. It’s the way we’re been programmed as bloggers. Your email list is the goal. It’s your blog asset. But what I mean when I say your blog takes a community is more akin to Hillary Clinton’s statement that it takes a village to raise a child. Your readers are important. They motivate you to keep creating content. BUT to create an effective blog you need support. That support takes different forms. Whether you’re a newbie blogger or an experienced blogger, chances are your blog needs help from your blog community. Here are 5 types of blog community people who can give you the support you need. Many bloggers have trouble continually coming up with new blog post ideas. I get it. To be honest, I turned down writing a column for ClickZ because I didn’t think that I had enough ideas to write about. Once I proved to myself that I could keep a weekly column going, I finally started a blog. That worked for me until it didn’t. There were days that I called “wandering in the desert” since I knew that I had to publish a post but I didn’t have any idea of what to write. Looking back, those posts showed my strain to write. They weren’t as good. To ensure you have a steady stream of blog post ideas, get input from your community. Mind you—I use the word community since you shouldn’t limit yourself to your primary contacts like your co-worker, partner or best friend. 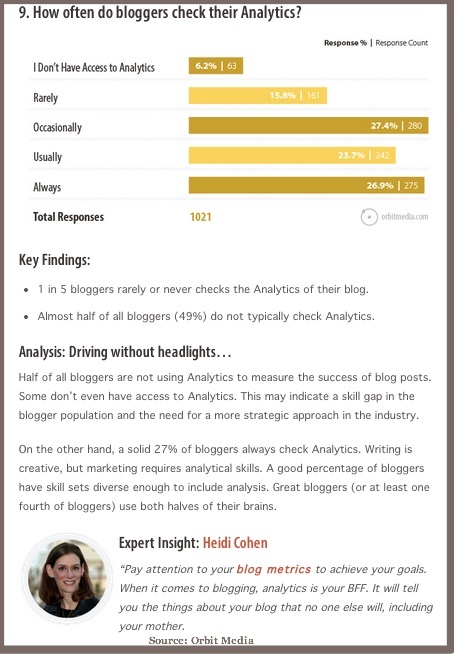 Who reads your blog (besides your mother)? Specifically, what makes them similar? What type of information do they actively seek? What problem are they trying to solve? Why do they need this information now? Understand what’s changed in their situation. What’s causing them to act? When do they seek this type of content? 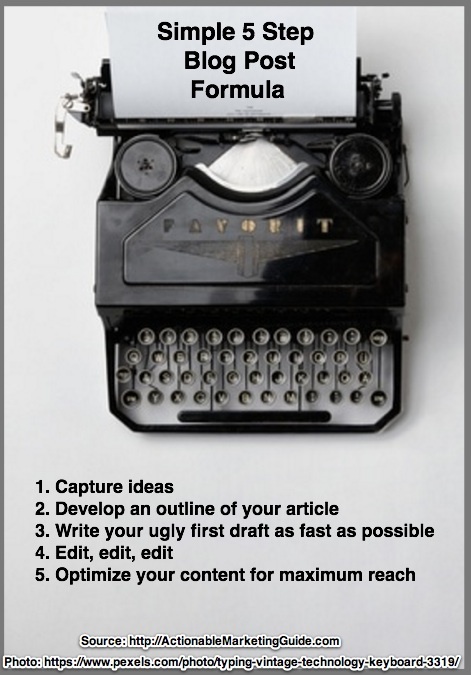 This determines when to publish blog posts. Where are they when they consume your content? This influences the type of device they use to consume your content. It also indicates their attention level. This translates to content formatting (desktop or smartphone) and type (text, audio, or video). Employees. Solicit input from across your organization. 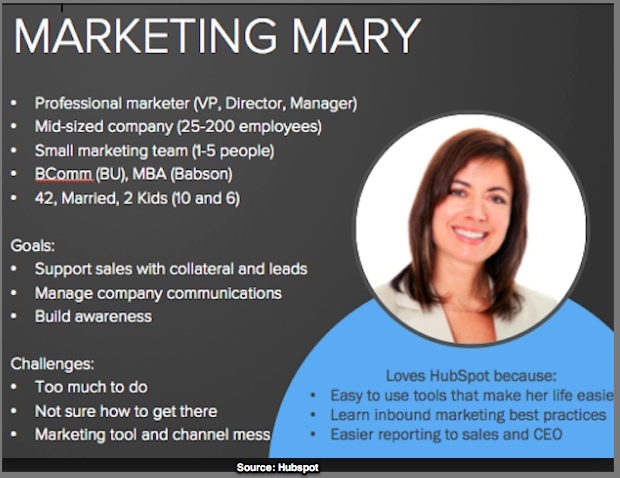 Ask people who engage directly with customers, like sales and customer service. Include technical staff since they’re trusted. Thought leaders. What topics do they think are key? Don’t just regurgitate their ideas. Extend or provide different point of view. Social media participants. What are the people you follow and the people who follow you saying or asking. 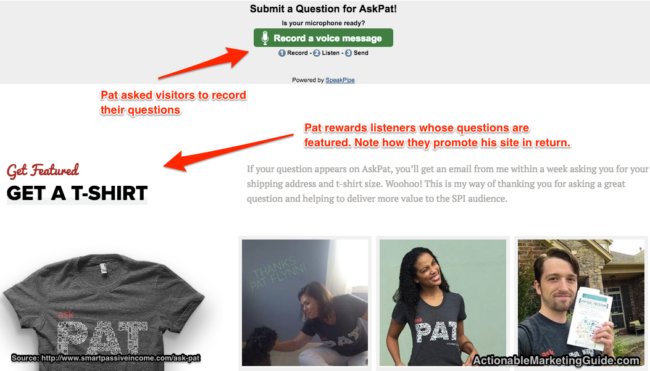 Smart Passive Income’s Pat Flynn asks podcast listeners for their questions and rewards them. Broaden your blog content’s appeal. 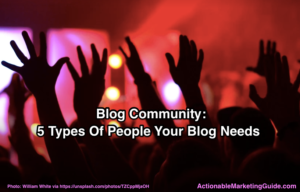 Ask members of your community to contribute to your blog content. Orbit Media’s Andy Crestodina never writes a blog post without asking at least one influencer for input. Often, he asks more than 1 person. With his blog research, Crestodina upped his blog community people outreach for data and influencers. The result: He spotlights influencers to his readers and builds a deeper relationship. Here are 5 ways to tap into your blog community to create content. Influencers. Ask for input to 1 to 3 questions. In return, spotlight the influencer and link to his blog. This doesn’t have to be someone you know directly. Take an example from another blog or piece of content. BUT link back to the original and observe their terms and conditions for using their material. Interview people. 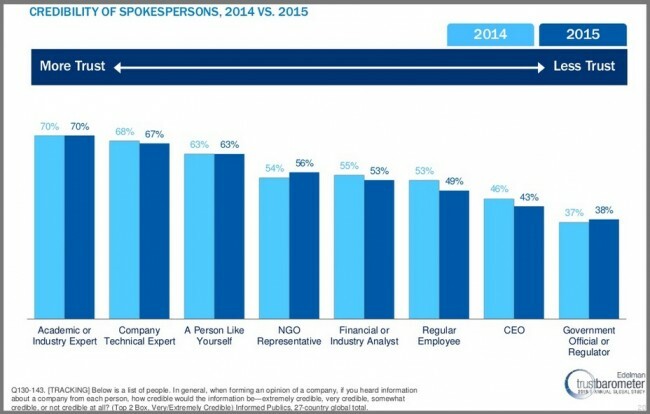 Ask employees, influencers or customers. This can be a one-on-one exchange done via text, audio or video. Alternatively, it can be a panel discussion where you ask many people the same question(s). 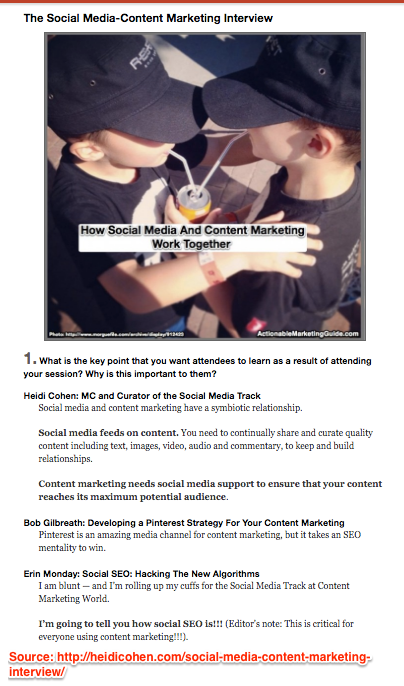 I did this for Content Marketing World. Presenters. Live blog events. Translate the information from an event or conference into a summary. Again give credit and make sure that you have permission to do so. Top Rank Blog does this well. 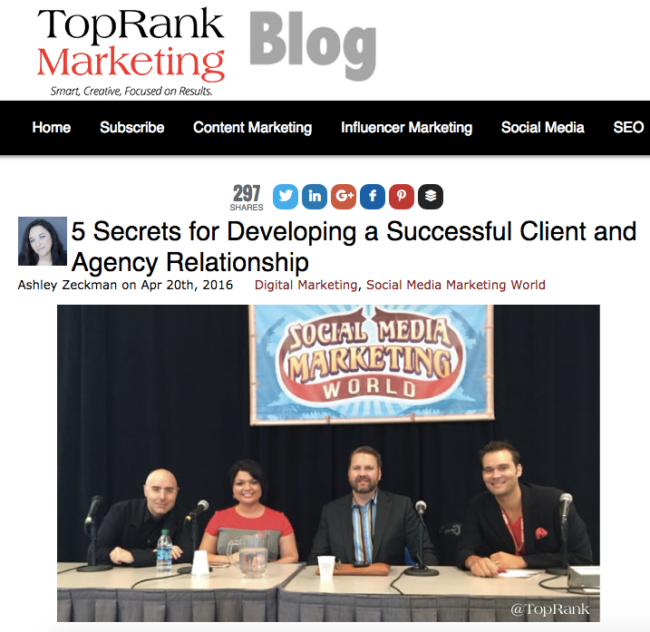 Here’s an example by Ashley Zeckman from #SMMW16. Customers. Show their success stories. Ask customers to provide their photographs and videos showing how they used or styled your product. (It’s 1 of the 5 basic content types.) Knitting stores like Knitty City do a great job of this. 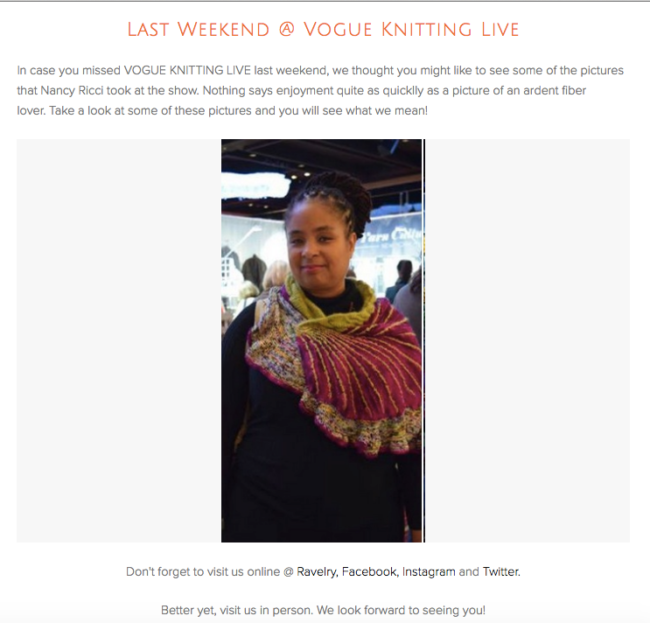 Let your customers strut your products- Your pics or theirs! Your first draft is never your best draft. This is true even if you use a spell checker! My sister was surprised to see her son’s college essays improve markedly after multiple iterations and gathering input from a number of people. I laughed. That’s how you get great writing. Even the best writer needs to continually edit their content. Ideally let your blog post sit overnight. This allows you to have a fresh set of eyes and perspective on your writing. It helps you see the poor grammar and awkward phrases. I totally get this isn’t always possible. Professional copyeditor (or editor). My editor read my ClickZ columns for content and direction (Hat tip: Rebecca Lieb and Anna Marie Virzi). Then they were whipped into shape by the copyeditor. (Hat tip: Erin Brenner). 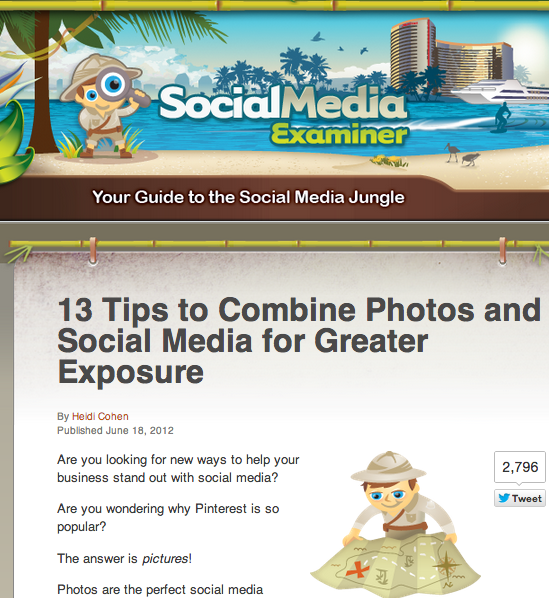 Both Social Media Examiner and Content Marketing Institute have professional editors. Employees. This is particularly important for a business blog. While your blog should use informal language, it shouldn’t have grammatical errors. Informal editor (Read spouse, family member or friend). They’ll catch more than you will even if they’re not an English teacher. My webmaster edits this blog and we still miss things that get corrected after publication. If you’re not a creative type or a techie, this is where you’ll need your blog community. The major functions that often require additional support are search, creative (including visuals and typography/layout), technology and project management (depends on the size and complexity of your blog). Employees. If your business is big enough to support additional resources, tap into them. At a minimum, ensure that your blog is integrated into your website, marketing materials and search marketing. Freelancers/agencies. Depending on your budget, you may be able to support additional resources. Friends and family. Tap into your network and exchange your skills. Don’t expect anyone except your spouse and kids to do anything for free! While you can automate your blog post publishing and email distribution, it takes more to get your precious content noticed and read. Social Triggers’ Derek Halpern is famous for posting less than 3 times a month. Yet he’s built his email list to 26,778 subscribers in 13 months. He believes in the 20% content creation/80% of your time on distribution (promotion). Email house file. These are the people who raised their hand. They want your stuff. Social media. Share your blog post on social media. Also make sure you’re your blog post is optimized for social media. This allows readers to share your content. Influencers. Write to the people you mention. Don’t expect them to do anything. Note: Don’t expect them to take any action. As with any big undertaking, it’s useful to have someone who helps hold you accountable. To this end, a blog buddy provides support at each of these 5 steps. The best opportunity is to find someone whose blog is at the same level as yours. For example, you both have been blogging for the same amount of time and have similar size lists. Further, while a spouse or child can help you with your editorial or other skills, your blog buddy should be another blogger. They understand what you’re going through. Even better, they don’t bring the other baggage involved in your non-blog relationship. Social media divas Peg Fitzpatrick and Rebekah Radice are blog buddies. They support each other’s blogs and social media efforts. Observe what they do so that you can apply those lessons to your blog buddy. Why go blogging alone when you don’t have to! Give your blog content the best chance it has of succeeding by getting support from your blog community. Don’t wear out your welcome by hitting up the same people all the time. Maximize your reach by reaching out to a variety of different people. Remember the manners your mother taught you, thank everyone who helps for their support. Tags Andy Crestodina, Ashley Zeckman, ClickZ, Mike Allton, Pat Flynn, Peg Fitzpatrick, Rebekah Radice, Social Media Examiner, Top Rank Blog. Bookmark the permalink. Pingback: Reading Roundup: What's New in Blogging Lately? This is indeed a great approach required for success. It’s very key to have an engaged blogging community in order to maximise the growth of your email list and overall readership.